To Save Everything, Click Here: How your generalizations about Silicon Valley get the tech industry wrong. How your generalizations about Silicon Valley get the tech industry wrong. One thing I’ve discerned from your book and your response to my critique is that you worry a lot about generalizations. You’re a man of clarity and nuance. You want to be sure that nobody calls you a technophobe, because that would imply that you hate all forms of technology, and clearly you don’t—not only do you use Twitter and iPads and word processors, but you’re also a fan of combination safes and eyeglasses. Since practically everything one encounters in the modern world is a form of technology, the entire planet can come to your defense: How can anyone call Evgeny Morozov a technophobe—he uses an iPad! Your war against generalizations also applies to the Internet, a term that you almost always render in quotes, and which you’re fond of suggesting doesn’t even exist. When we talk about “the Internet” rather than the specific inventions, people, and companies that are utilizing the network, “our technological debates will remain lazy, shallow, and unproductive,” you write. You’re especially irked when we talk about the Internet as if it’s alive and has some kind of fixed, inherent moral logic to impart to the rest of society—when people say that the network automatically advances civic “openness,” that it kills gatekeepers, or that it favors leaderless mobs. The Internet doesn’t “want” these things, you insist. The Internet is just a series of tubes without an ideology. Particular people and companies are the ones that want these things—often for misguided, thoughtless, and venal reasons, you argue. I take your point. I and pretty much everyone else who thinks or writes about the digital world—both skeptics and boosters—rely on broad terms like “technology,” “the Internet” and, er, “the digital world” and its “skeptics” and “boosters.” You may be right that such generalizations sometimes obscure rather than illuminate our conversations. Often, though, I don’t think this is a big problem. When Nicholas Carr argued in his book The Shallows that “the Internet” was ruining his brain’s ability to concentrate on deep texts, I understood exactly what he meant, because the Internet—by which I mean, of course, email, smartphones, Twitter, Facebook, Wikipedia, Google, hyperlinks, etc.—has done exactly the same thing to me. Yes, as you point out, some technologies built on the Internet (like Instapaper) are designed to promote the sort of deep thinking that Carr says “the Internet” has killed. What’s more, none of the technologies that are ruining his concentration (not even hyperlinks) are an immutable part of “the Internet.” Yet, still, the generalization works: The Internet that Carr describes is one that many people will recognize as the attention-sapping force they grapple with every day. 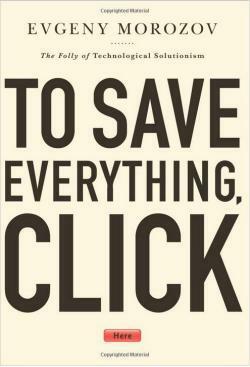 To Save Everything, Click Here, by Evgeny Morozov. Yes, as you point out, the number of people you attack in To Save Everything is truly impressive. Even better, a few of those people actually live in Silicon Valley, and a handful of them (Thiel, Schmidt, Mayer, Hoffman, Zuckerberg) hold on to actual levers of power in the tech economy. Still, as I read To Save Everything, it’s just not accurate for you to claim that you “attack everyone equally.” Here’s some empiricism for you: By my Kindle app’s crude keyword count, you mention Jeff Jarvis, Jonathan Zittrain, Tim Wu, and Lawrence Lessig at least two dozen times each, and Clay Shirky comes up almost 60 times. Sure, all of these guys are well-known pundits, but they’re all either lawyers or media theorists—not a single one of them is an engineer, startup founder, tech exec, or investor, and none of them has any real sway in how tech is created, sold, or used. If they all went mute tomorrow, I doubt very much that anything about technology and how it spreads would shift in any meaningful way. Meanwhile if you search To Save Everything for Larry Page, you’ll find him just three times. 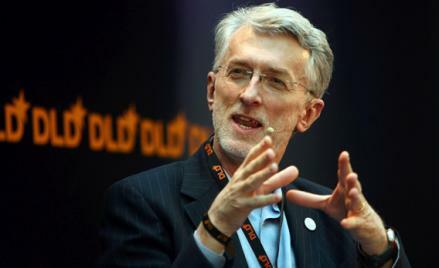 Mark Zuckerberg and Eric Schmidt come up just a bit more, but nowhere near as often as you mention Jarvis. Marc Andreessen, the Valley’s most important financier, is nowhere to be found. And Steve Jobs is mentioned just seven times—exactly as many times as you invoke one Farhad Manjoo. Now, Evgeny, while most of your readers will likely agree that Slate’s tech columnist plays an indispensable role in the popular conception of technology, I’ve got some news for you: I’m a tiny bet less important than Steve Jobs. My focus on how you misuse “Silicon Valley” might strike you and our readers as splitting hairs; after all, as you say, you didn’t aim to paint a comprehensive portrait, and I certainly believe that. But I’d argue that once one pierces your picture of the Valley, much of the rest of your thesis falls apart. If you want to convince us that solutionism represents a dangerous force in the world, you should first be able to identify a cohort of solutionists with the power to do anything to further their worldview. But you can’t do that, because few of the world’s leading tech companies—not even Google, the most overtly messianic—see the world with anything like the consistency that would be required to sustain the solutionist mind-set. You’ve conceded that Apple doesn’t fit. So let’s look at Amazon. Is its chief goal to offer us fixes to problems that aren’t really problems? I really can’t see how. Maybe you can sketch out a solutionist pattern in all of Jeff Bezos’ opaque, money-losing initiatives, but when I look at his company I see a story as old as the bazaar: Bezos just wants to sell us a lot of stuff at low prices. How about Facebook? You quote Zuckerberg’s puffery about making the world better through connections, and you seem to take it as serious evidence that Zuckerberg is in this for more than money. Yet Facebook falls down on some of the key tenets of “Internet-centrism” advocated by folks like Jarvis, Shirky, and Zittrain. Its network is famously closed, allowing only selective access to third parties that have been blessed by the company. Facebook won’t even let you remove your data very easily. It’s a classic gatekeeper, and I suspect most of your solutionist opponents harbor little love for it. I’ll grant that much of your critique fits Google; were your book limited to the search company rather than “technologists” as a class, I’d have an easier time buying your thesis. Yet even Google’s goals and motivations are more complex than you make them out to be. At one point you bash Google for its fetish for promoting algorithms over people—for behaving “as if introducing humans to occasionally review the work of its algorithms would be tantamount to abandoning all faith in artificial intelligence as such.” Yet that’s not exactly the case. The search company recently disclosed that it employs a group of humans to rate its search results, and that it is warming to the idea of tweaking its algorithms with human input. This may not be as much human influence as you’d prefer, but Google is clearly showing more flexibility than you suggest. It’s precisely because the real tech industry doesn’t fit your ideas that you instead focus on a bunch of academic theorists, a few journalists, some overeager early adopters, and a cloud of vaporware. Now, you’re certainly within your rights to criticize prototypes and overhyped tech trends instead of real technologies; as you say, some of them might come to pass, so it’s better to attack them early. And I agree with you, for all the reasons you state, that it’s misguided to expect that “users” will always anticipate and avoid the most dangerous stuff. (Note that when I proclaimed facial-recognition technology to be inevitable, it was because I saw signs that people were demanding it in several products.) At the same time, your book entirely overlooks people who buy and use technology. Don’t you think that users exercise any control over their tech environment? I do. That’s why you still haven’t convinced me that I’ve got anything to fear from that smart kitchen, and I don’t believe for a second that any municipality is poised to hand out trash cans equipped with cameras that post pictures of your garbage to Facebook. You point out that two city workers—not mayors, as you say, but instead people in the tech departments in Edmonton and Boston—recently spoke approvingly of “gamification” at a tech conference, and that a single think tank connected to one English city printed a report friendly to sensor-based tracking. To me, this sounds like thin evidence that dystopia is on the way. In fact, city council reports seem like something you’d approve of: a slow, measured, maybe even thoughtful approach to adopting technology. But maybe you’ve got a darker imagination than I do. Can we be clear, at least, that you’re going off on a pretty speculative limb? If you’re conceding—and it sounds like you are—that your fears are built atop academic prototypes and long-term tech projections, then it follows that your case is as thin as any other futurist’s. Rather than get alarmed about the potential technologies you reference, why shouldn’t we view your book as something like a 1942 issue of Popular Mechanics that tries to imagine life in 2013?